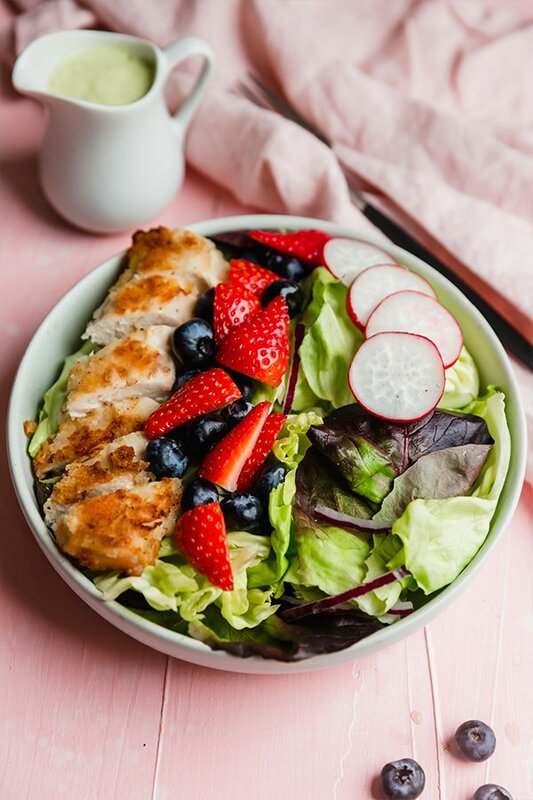 This crispy chicken salad is made with a grain free breaded chicken, fresh berries, crisp vegetables, and an avocado ranch dressing. It’s paleo, whole30, and AIP compliant. The word “crispy” is very popular at my house. My husband wants everything to be crispy… fried eggs, sweet potatoes, and of course, he loves crispy chicken. I’m always trying to find ways to reinvent favorites to mix up our rotation and wanted a new crispy chicken recipe. I’ve shared many chicken nugget recipes on the blog before, but never a crispy chicken salad! 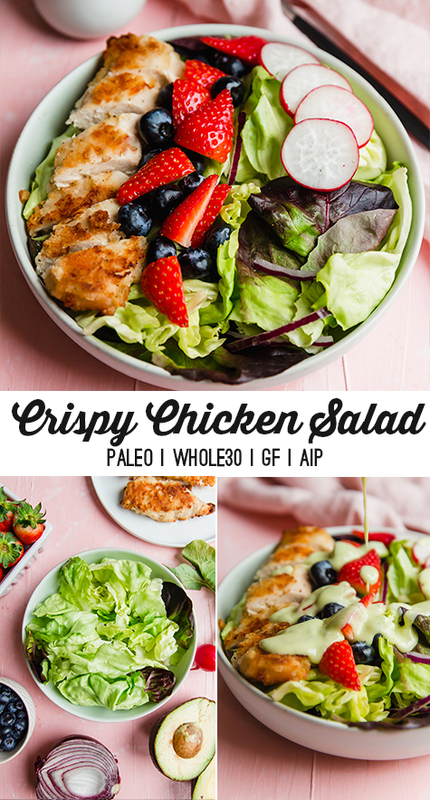 This paleo crispy chicken salad is perfect for people who are apprehensive about salad. It doesn’t really feel like a salad. 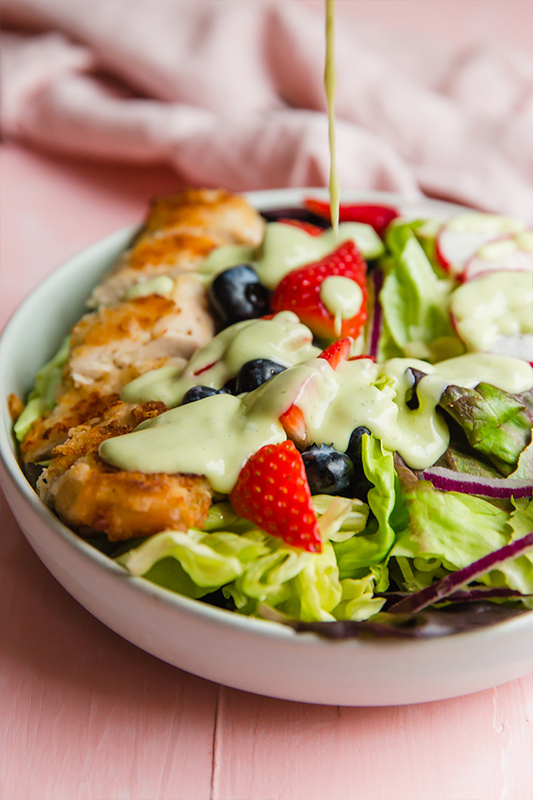 The crispy chicken is made without eggs or grains (hello, allergy friendly) and the salad is topped with fresh berries, flavorful vegetables, and a creamy homemade avocado ranch. Whether you just want a healthy lunch option, or you’re looking to mix up your paleo, whole30, or AIP routine, this salad is perfect to make this spring and summer! Store the chicken separately if you’re meal prepping this salad. If you’re making this ahead of time to bring to lunch, you’ll want to keep the chicken separate to keep it crispy. Make the dressing as fresh as possible. Since there is avocado in the dressing, it’s susceptible to browning. Either make it right before you eat the salad, or add some lemon juice to help with any potential browning. You’ll want to slice the chicken breast into tenders. So, if you have two larger chicken breast, you’ll wind up with somewhere around 4-5 chicken tenders depending on the size and shape of the chicken. This helps the chicken crisp up a lot better than a larger breast. From there, you’ll be able to slice it and serve it over the salads for that classic crispy chicken salad look and feel. This makes up the breading for the chicken. I don’t recommend using tapioca starch as it tends to lean more on the gummy side rather than crispy. These are the base of the avocado ranch dressing. I use native forest simple coconut milk from a can to avoid any weird flavors or thickeners. However, the dressing is totally optional and you can just opt for a premade dressing that you tolerate or another one that you prefer. These are the ingredients for the salad. 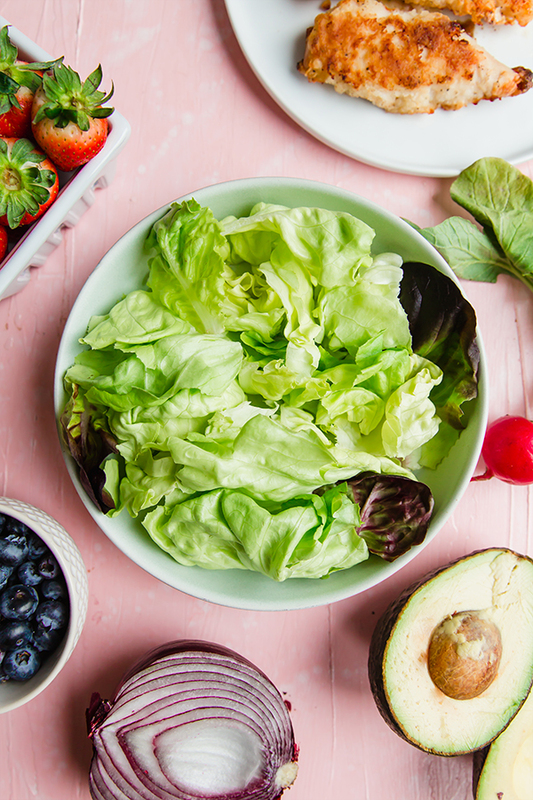 You can easily use another lettuce base like mixed greens or romaine, and other vegetables to top the salad like carrots, apples, tomatoes (if tolerate), etc! These are just the flavors that I feel pair best for a spring and summer salad. Slice the chicken breast into tenders (this helps the chicken get crispy) and marinate in a bowl with coconut milk and apple cider vinegar for 20 minutes at room temperature. Drain the excess milk when done. Prepare the coating by mixing the arrowroot starch, coconut flour, salt, and pepper. Dredge the chicken in the breading until thoroughly coated. Bake in the preheated oven for 30 minutes (carefully flipping halfway through) or until the internal temperature reads 165 F.
Allow the chicken to cool slightly before slicing and adding to the salads. Using a high-speed blender, blend all of the ingredients until smooth. Season further to taste, or add more milk in a thinner dressing is preferred. Prepare 3 bowls and divide the lettuce amongst the three bowls, along with the toppings, and sliced crispy chicken. I haven’t been able to find an AIP dressing that my husband will eat and he loved this one. Thank you! The chicken was delicious as well!